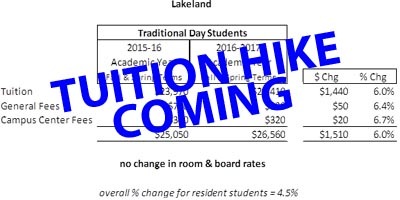 In a mass email sent out on Monday, March 14 from Lakeland College President Dan Eck, via Director of External Relations David Gallianetti, it was announced that for the 2016-2017 academic year, tuition will increase by six percent. 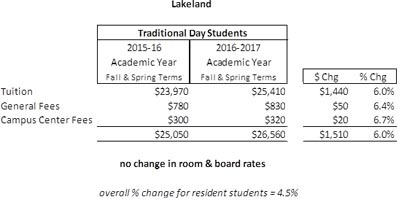 According to Vice President and Chief Financial Officer Carole Robertson, tuition for this academic year of 2015-2016 for traditional day students was $25,050. With the six percent tuition increase, next year’s tuition will total $26,560. Stated in the email, Lakeland “had the lowest tuition among Wisconsin private colleges” in this past year, and despite the increase, it is “within the typical range of increases for colleges like Lakeland, and even after this increase (Lakeland) will remain at or just above the lowest tuition and room and board in the state – well below the average for state private colleges,” said Eck. In recognition of the need to financially plan, there is an attachment in the email with a variety of payment plans and dates for those plans for the upcoming school year that students and families can utilize. For more information regarding this information, students can see the email. For questions or concerns regarding financial aid or tuition, contact the Office of Financial Aid.